Quick and easy cleaning for additional radiance and vivid colors. The solution contains PTEF-polymere, which protects against damaging UV-rays. €17.95 Incl. tax, excl. shipping. Quick and easy cleaning for additional radiance and vivid colors. The solution contains PTEF-polymere, which protects against damaging UV-rays. 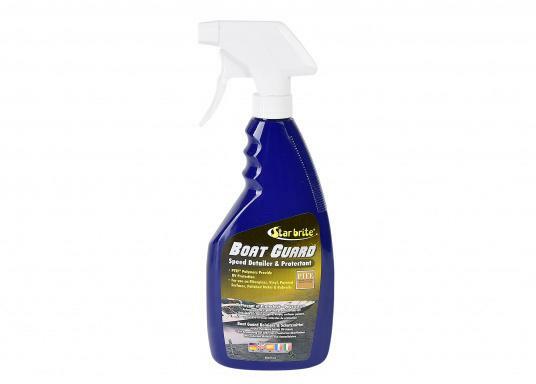 Suitable for fibreglass, metal and painted surfaces. Let your hems shine bright again. Removes dirt and debris gently and smoothly. Contents: 650 ml. Spray on to the targeted surface area, and apply with a soft, clean towel in circular motions. Use on surfaces with a max. area of 45 x 45 cm. Let the product dry in to a film, before polishing the surface with a soft, clean towel. Use as often as deemed necessary. In order to achieve maximum protection, a yearly application of Star Brite Premium Polish with PTEF is recommended. Avoid spraying on glass or other substances. Immediately remove excess solution, in order to avoid streaking or spotting.